Buy at Amazon.com Bruckner's only major chamber work dates from 1879, a tumultuous time in his compositional career when he had just finished the final version of the Fifth Symphony, was about to produce the definitive version of the finale of the Fourth Symphony, and had just begun work on the Sixth Symphony. Translating the grandiose, contrapuntal and brass-heavy Brucknerian idiom into the realm of chamber music poses obvious challenges, which Bruckner tackled by adding a second viola to the conventional string quartet texture, and by imposing an economy of form that limits the String Quintet's overall length to about 45 minutes — still formidable by 19th century standards, but nevertheless shorter than any of his symphonies from No. 2 onwards. This structural compression is most notable in the finale, one of Bruckner's finest and most unusual creations. 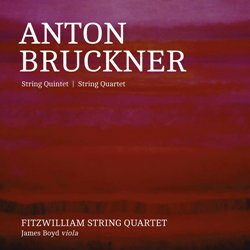 Like any string quintet, Bruckner's F major offering struggles to gain traction with audiences and musicians distracted by the far vaster repertory and ensemble roster for string quartets. If that weren't enough, string players specifically grumble about Bruckner's awkward melodic lines and his insistence on highlighting uncomfortable flat keys. Despite that, his Quintet is blessed with several fine recorded performances. My favorite comes from L'Archibudelli, a period instrument outfit whose name derives from the Italian for "gut strings". They indeed eschew the metal strings that started to predominate in the late 1800s, and like most ensembles focusing on historically informed performance, they avoid the habitual thick vibrato that became standard on bowed string instruments during the Fritz Kreisler era, but instead reserving that technique for slow or lyrical passages. What comes through most vividly in their 1994 Sony recording is a raw enthusiasm for this music. And the slower attack time and rich harmonic spectrum of the gut strings (contrasted with the more responsive envelope and brilliant timbre of their modern steel-core counterparts) seems especially well suited to Bruckner's sound world. Indeed L'Archibudelli's version of the Quintet sounds the most "symphonic" of any I've heard. It's interesting to compare it with more conventional modern interpretations, such as that by the Melos Quartet (with 2nd violist Enrique Santiago) which dates from about the same time. The Melos rendition is solid and intelligent, and avoids dragging during the distended Adagio movement. In between these two approaches is the 2011 recording by the Fitzwilliam String Quartet (plus violist James Boyd), a group that usually employs modern instruments but which turned to hand-wound gut strings for this recording. Like L'Archibudelli, the Fitzwilliams reflect the current (and welcome) trend toward more modest use of vibrato. They take the fast movements more broadly than the others, making up for this with a brisker pace in the Adagio. And true to their vision of late 19th century Viennese performance standards, they add the occasional bit of rubato and portamento to their interpretation, which should appeal to listeners who want to savor each note. 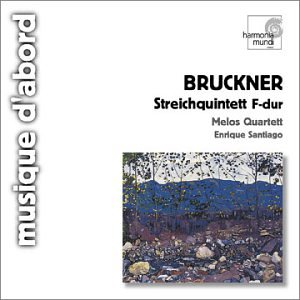 Most of the Quintet legitimately "sounds" like the Bruckner we all know from his orchestral and choral works. Organist as he was, he mainly conceived of sonic mass through the projection of individual lines, and he conspicuously avoids multiple stops in his Quintet (the work is almost devoid of triple/quadruple stops, and even double stops are infrequent). Instead he conveys his characteristic sense of sonority through careful use of register and instrumental spacing. All three of these recordings successfully communicate this sense of breadth that's so essential to any Bruckner experience. An interesting stroke in this otherwise fairly standard sonata-allegro movement comes at the crux of the development section. In lieu of a loud climax, Bruckner reduces the texture to monophony, a single unaccompanied instrument playing eighth notes derived from the third and fourth measure of the main theme, which in turn leads into the recapitulation at a pp dynamic level. Originally in third place, it was apparently too difficult for the intended premiering musicians, so Bruckner contributed a substitute Intermezzo (also in D minor). I'm not sure what was so challenging about the Quintet's original scherzo (it seems no tougher to me than the finale, for example), but the Intermezzo appears as the fifth track on all three of these albums, so you can compare for yourself. Both alternatives use the same Trio, which is a rhythmic and melodic relative of the Trio in the Fifth Symphony. L'Archibudelli's propensity for audible "group breathing" is occasionally audible here, but not distractingly so, at least to my ears. Their tempo is the most lugubrious, a minute longer than both the Fitzwilliam and Melos ensembles. A highlight of the latter's performance is the ppp G♭ pedal in the cello that ends the movement: seamless and exquisite in their rendering. After 16 bars, though, instead of resolving to G♭, there's a short rest, followed by a sudden change of tempo, tonality and mood. The cello enters with a pedal on low C, the 2nd violin and 1st viola resume more sinister spiccato arpeggios, and the 1st violin and 2nd viola exchange a brief turn motif that lasts three beats, though the time signature remains 4/4. ...then peters out in a combination of low spiccatos and pizzicatos. The 1st viola's eighth notes are reminiscent of the second theme in the Second Symphony's finale, with its leaps of a sixth, and it's this line that gets most of the developmental attention later on, even though the main voice in this gesangsperiode is the soaring cantilena in the 1st violin. Getting the balance right here is a challenge due to the complex counterpoint and Bruckner's predilection for moving the primary melodic focus among the instruments. Of the three recordings, here I prefer the engineered emphasis on the bass that enhances the cello pizzicatos in the Melos rendition. 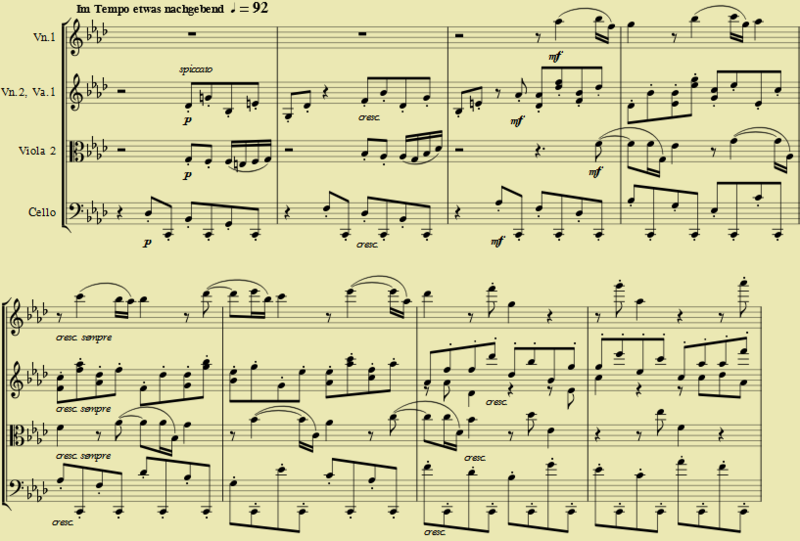 Gradually the other four instruments get their own fugue-style entrance with the cello theme, each one in a different key (unlike a classical fugue). This closing theme leads directly into the development, which mainly concerns itself with the cello theme and its accompanying triplets, along with the earlier 1st viola line in its "pure" form with the sixth leaps. All these elements are freely inverted and recombined in the familiar Bruckner manner. In some of the softer passages, the Melos musicians choose to play without vibrato to contrast with the more lyrical expositions that came earlier. Then the triplets that accompany it peter out the way the first theme group did in the exposition. The second theme group follows, but in the "wrong" key of D♭ major. This section otherwise gets a fairly literal repetition, but instead of the cello continuation, there's a codetta, another pause, and then a proper recapitulation of the first theme group, with the pedal transferred from second viola to cello and transposed from D♭ to C. Note how this harmonic motion represents a prolongation of the movement's initial D♭ to C bass movement. The middle strings pick up this idea, while the lower two instruments turn to F tremolos underpinning the F major arpeggios in the 1st violin that bring the work to a close. Until this 29 bar coda, there has been no conventional recapitulation in the tonic, nor any restatement of the closing theme in any key, nor any particular establishment of F major as a tonality elsewhere in the movement. The finale isn't so much in sonata form as it is in a kind of arch form similar to that found in Brahms' Tragic Overture or the last movement of Sibelius' Fourth Symphony, and its tonal design only makes sense in the context of the entire four-movement work. A nice bonus in the L'Archibudelli and Fitzwilliam albums is the inclusion of the C minor string quartet that dates from Bruckner's apprentice years. 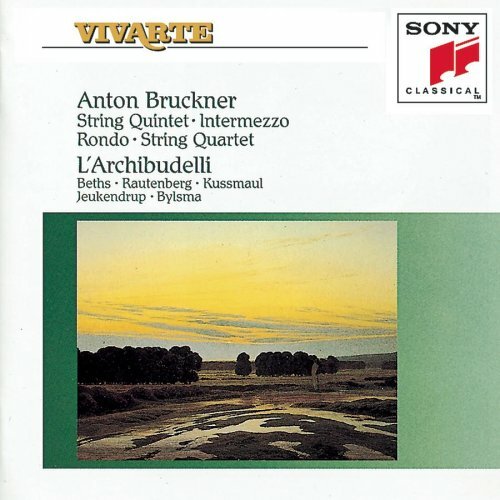 L'Archibudelli additionally offers his standalone Rondo in C minor, thus completing the collection of Bruckner's surviving chamber music for strings. These early works don't yet have the recognizable Bruckner sound, but they do offer traces of the genius that would eventually burst out. Nevertheless, any of these three albums is excellent enough to please those interested in exploring the underappreciated gem that is the Bruckner String Quintet. Original Material and HTML Coding Copyright © 2014–2017 by Michael Schell. All Rights Reserved.